Another event has come and gone, and leading up to it I was extremely hyped to get my hands on the near finished product but I had reservations. At first, I was pretty hesitant and was expecting the worst. When the Gamechangers were first brought on board to work on the game, the NHL series was just coming off one of it's worst product launches in years. The graphics took a big leap, the gameplay took a new direction however it didn't play as intended, and it severely lacked content.. especially disheartening to learn a fan favorite mode such as EASHL was going to missing from NHL 15. Most of us that posted on the forums never felt like our suggestions/opinions were being read and would fall on deaf ears, it started to feel like the community was invisible and we could do nothing about it. It was time for a change, so EA NHL decided that they would take some of their biggest fans and have them be apart of the development for the NHL series. A large chunk of the community, including myself believed that this program was just going to be used as a way to generate some positivity without actually utilizing the team of members they brought on. Event #1 was us getting to know the developers and letting them know what we thought was important and things we would like to see. The pillars of design and features were already decided before we showed up so it was basically letting us know what NHL 16 is going to be about. The new EASHL direction was terrifying and exciting. People don't like change.. I felt that if they do it right this could be the start of something awesome, but if the classes are not balanced we could be in for a rough year. Event #2 was the big test to see if the NHL team could put together everything they said they would. They started with a feature video that got us all kinds of excited. We got our first ever hands on to explore the modes and test out the gameplay. 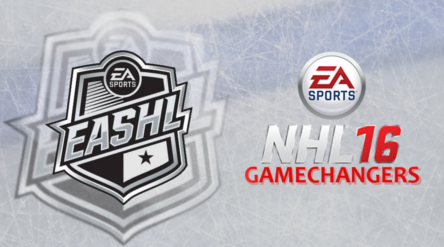 The modes themselves looked chalked full of content, the new direction of the EASHL with player types/builds was finally getting it's first test. This is where myself and others got scared. The gameplay wasn't quite there, the incidental collision felt like it pulled you from the experience along with many other issues. (This was the earliest EA has ever shared NHL for a game test so this was expected.) We talked for hours about what was needed to make the gameplay better, we also got to help with figuring out what was important and what should take precedence over other small features. We left this event wondering whether this committee was going to be utilized and the next event was going to give us our answer. Event #3 was slightly extended to have 3 full days instead of the 2 that the previous events had. We arrived only to immediately get straight into the game. We selected our player classes and jumped in. Almost immediately I could feel and see the changes that they have made in the few short weeks since the previous event. I had a check list of things that I wanted to see fixed and I was easily checking these off mentally in my head as we played. Incidental collision was a non factor now and felt like it should, goalie's drawing penalties was gone, the passing felt 10x better, the precision movement felt much more like the developers intended. The auto deke's required much more user intention to trigger now and actually felt like they happened when you wanted and expected them too. Things actually are changing for the better. The biggest thing that we got out of this event was that the developers are actually committed to listening to the community and making something with our help. Everything we discuss is always written down and they are constantly looking for solutions for them. I wrote down a list of concerns and questions for the developers from a few threads that were created leading up the event and they are aware of them. A lot of the answers cannot be shared publicly but they are aware of them and are constantly looking to improve their game. Something I should touch on is the information that is and can be shared with you guys. EA is a publicly traded company so any information that is shared must be 100% accurate and must have a 100% chance of being included in the game. Unfortunately the developers have to work with this and have their hands tied on things that can be shared with you guys. You can see with other INDY games and publishers that they can constantly have lists of what they are working on and things they may or may not include in the future, with EA that is just not the case. The most reason example of this is the goalie announcement they made. Goalies were a main feature that was being worked on throughout the year and as time progressed it was unsure of whether or not they could actually make it into NHL 16, so when the main feature list was announced they had to be left off. Once it was 100% sure that they can make it into the game, it was announced. So just because they have not announced something doesn't mean they haven't been working on it. I am sure they wish they could work directly with the community as a whole but it's just not possible. The Gamechangers are there to represent what you guys want from the game and all concerns that you guys have are brought to them face to face. With that out of the way.. I will get into some of my thoughts from this past event. -The newest version that we played showed significant gameplay improvements. We had plenty of concerns that had been addressed from the previous event before we played. -The puck movement was much better and the passing felt good. -Forwards/Defense ability to pick off passes was finally relevant again. Gone are the days of forcing passes through 3-4 bodies to get that perfect tape to tape pass. -Precision movement felt great, the One-T movement was great along with the shot! -Classes felt different from each other, they felt more like their roles entailed. -Good defensive plays were rewarding, bad defensive plays ended up in the back of your net. -Goals were generated from solid chances instead of lucky bounces. -Auto dekes only happened when they feel like they should happen. Required more user intention to trigger. -Human goalies as compared to AI Goalies changed the flow of the game - as with previous NHL's.. however with awful human goalies in net the amount of puck battles and scrambles to keep the puck away from the mesh was hilarious and fun. -I love the direction the gameplay is taking, just need to keep improving it bit by bit. -New goalies: Feels like you have all the tools you need to make the saves, just need the skill to put them together. Desperation butterfly save is an amazing addition that goaltenders will love. Still needed some tweaks on the goalies movement/precision movement. -Hitting is fun and rewarding, a defense man angling a player to the boards and laying him out has never felt better. -Faceoffs are as close to even as you can get between all the classes. Defensive builds have a fraction of a hair better but skill/timing makes up for it easily. If you are good at faceoffs you will win them consistently no matter what build you choose. -Defenseman feel like they are extremely useful, their poke checking and body position has never been so important. Your ability to get in the way of the shooting lane/passing lane will make a huge difference. -GM Mode is chock full of content, the new player morale adds a ridiculous amount of depth that you can get lost in just trying to keep your players happy, or if you are evil.. making them all as upset as possible. -Be a Pro, shift to shift simming is finally back. The new progression system mixed with the on ice tasks adds hours of entertainment. -HUT of course is HUT. Single player seasons and the ability to play a friend. -Couch co-op for those who love to play with friends. -EASHL is back and may take some getting used to. No longer are you grinding for 350 games to keep up with the players who have way too much time on their hands. Now it's heavily reliant on skill and teamwork. Trying to find what class best suits the way you play the game, and finding the right combination of them with your teammates. Ben does an excellent job at explaining the new goalies. Overall, we put Core Movement/Positioning on your Left hand and Saves on your Right hand. You can press the left stick and drop to butterfly to get a traditional butterfly slide keeping that momentum or you can use the Right Stick to stretch out more towards the post on the side you are pressing to. The Right Stick move is more committed but takes away more of the bottom of the net to that side. You won't usually want to move left and right when tracking using the right stick as much as you would use it to make a final committed slide/save attempt but you may use it to quickly get to one side before standing up and squaring back up. As a note on precision movement vs the t-pushes: Precision is different than it was in the past. In the past, you basically had side steps/strafes and smaller side steps. Now you have more squared up movement, used to track a single player with the puck and t-push movement (non-precision) to move quicker when the puck is moved a greater distance on a pass (it is more committed but gets you there quicker than strafing across). We wanted to give people full control over when they did both as opposed to assuming what movement you wanted based on puck distance in an effort to give more control to the Player. Goalies should use Precision movement like Defenders use Vision Control. You are squared up tracking a single player until you know you need to pivot and commit using a t-push (which is like pivoting to forward skating on defense to get to the new spot before re-facing up). All in all, I love the new direction that the NHL team decided to take. Finally feels like the community has a say, I hope that this relationship between devs and fans can continue for years to come. This is a big step in the right direction, and while the game isn't perfect it is now much easier to see where it is trying to go. Online team play, as of this event, is the most fun I have had since NHL 11-12. Hopefully we can build from this game and continue to make future iterations of it the best we can. They are committed to working with the community to improve their game and that to me is what we have been asking for years now, lets just hope it keeps getting better! They still have a few weeks to continue to tweak and hone the gameplay before going gold so don't be afraid of making constructive criticism, the developers and gamechangers constantly read the forums so it will not go UN-noticed. Feel free to ask questions and I will answer what I can! Well I'm glad they improved on pass interceptions. Playing as a defenseman in NHL15 is useless as passes go right through you all the time not matter how you're positioned, plus the fact that they took out tie ups and are extremely strict about hitting players near the crease. Do you remember if they added tying up another player back in the game? Also what about charging up passes? It still boggles my mind that they would remove that feature. Last edited by mdubz; 07-24-2015 at 10:58 AM.